FILE - U.S. Supreme Court nominee Brett Kavanaugh is pictured at the U.S. Capitol in Washington, July 10, 2018. U.S. Supreme Court nominee Brett Kavanaugh says he recognizes that gun, drug and gang violence "has plagued all of us.'' Still, he believes the Constitution limits how far government can go to restrict gun use to prevent crime. The Supreme Court has basically stayed away from major gun cases since its rulings in 2008 and 2010 declared a right to have a gun, at least in the home for the purpose of self-defense. Kavanaugh would be a "big improvement'' over Kennedy, said Erich Pratt, executive director of Gun Owners of America. Kennedy sided with the majority in rulings in 2008 and 2010 overturning bans on handgun possession in the District of Columbia and Chicago, respectively, but some gun rights proponents believe he was a moderating influence. "Kennedy tended to be all over the map'' on the Second Amendment, Pratt said. FILE - People applaud former Arizona Rep. Gabby Giffords as she arrives in the East Room of the White House in Washington, Jan. 5, 2016. In his 2011 dissent in a case before the U.S. Court of Appeals for the District of Columbia Circuit, Kavanaugh argued that the district's ban on semiautomatic rifles and its gun registration requirement were unconstitutional. That case is known as "Heller II'' because it followed the Supreme Court's 2008 decision in District of Columbia v. Heller striking down the city's ban on handguns in the home. "Gun bans and gun regulations that are not long-standing or sufficiently rooted in text, history and tradition are not consistent with the Second Amendment individual right,'' he wrote in a point rejected by the majority. He said few government responsibilities are more significant than fighting violent crime. "That said, the Supreme Court has long made clear that the Constitution disables the government from employing certain means to prevent, deter or detect violent crime,'' he wrote. 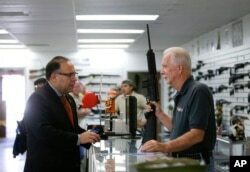 He said it was unconstitutional to ban the most popular semiautomatic rifle, the AR-15, since it accounted for 5.5 percent of firearms by 2007 and over 14 percent of rifles produced in the U.S. for the domestic market. Semiautomatic rifles were used in several mass shootings in recent years, including the February killing of 17 people at a Florida high school. He belittled the description of the guns as "assault weapons,'' saying that handguns could be called the "quintessential" assault weapons because they are used much more than other guns in violent crimes. The Giffords Law Center to Prevent Gun Violence said the dissent shows Kavanaugh believes the district's "good reason'' requirement for concealed-carry permit applicants is unconstitutional. His views on that subject drew more scrutiny after the 9th U.S. Circuit Court of Appeals ruled 2-1 days ago in a Hawaii case that people have the right to openly carry guns in public for self-defense. UCLA law school professor Adam Winkler, author of Gunfight: The Battle Over the Right to Bear Arms in America, said Kavanaugh could become that crucial fourth vote because three justices — Neil Gorsuch, Clarence Thomas and Samuel Alito Jr. — all have voiced support for the court to take on Second Amendment cases. Georgia State University law professor Eric Segall said the court's recent silence on gun laws has fueled speculation that neither the conservative justices nor their liberal colleagues knew how Kennedy would vote. Segall suspects the Supreme Court would be more likely to review a Second Amendment case if Kavanaugh is confirmed because there is less uncertainty about where he stands compared with Kennedy. "The lower courts are just all over the place, reaching different results on different gun laws. The court has to provide guidance at some point, and it will,'' Segall said.